Trying to purify your water supply? If so, there are a number of different water purification systems that can help you do so. The question is: which one is right for you? 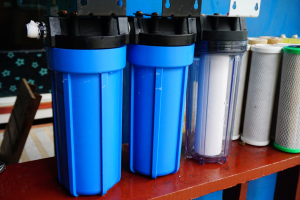 Perhaps you’ve narrowed your choices down to a water softener and a reverse osmosis system? Maybe you’re trying to understand the differences between the two systems? The fact of the matter is that water softeners and reverse osmosis systems are entirely different from each other, and are used for entirely different purposes. Below, we’re going to discuss the specifics of both systems so that you can decide which is best for your purposes. The fact of the matter is that both water softeners and reverse osmosis systems produce excellent tasting water. The type of water you enjoy more is highly dependent on your personal taste preferences. However, reverse osmosis water typically has a purer taste than does water softener water. This is because, while reverse osmosis systems remove essentially all contaminants from water, water softeners only remove calcium and magnesium. Not to mention, water softeners actually add sodium to your water. The result of this? Reverse osmosis water has no supplemental tastes. Water softener water, on the other hand, might have the slightest hint of salt. Ultimately, in most people’s opinion, reverse osmosis systems produce the superior tasting water. This makes sense, seeing as reverse osmosis systems are specifically designed to produce the ideal drinking water. When it comes to efficiency, water softeners reign supreme over reverse osmosis systems. This is because, while reverse osmosis systems only use about 10 to 15 percent of the water that passes through them, water softeners use the vast majority of the water that passes through them. In terms of electricity usage, both water softeners and reverse osmosis systems are extremely efficient. In most cases, both systems cost less than $10 to run annually. If you’re looking to purify your water supply as much as possible, we recommend going with the reverse osmosis system. These systems rid water of almost all contaminants, making it as pure as possible. Water softeners typically remove only calcium and magnesium. While this can improve the taste, drinkability, and functionality of the water, it does not purify the water to optimal levels. Regardless of the size of your water supply, there is a water softener and a reverse osmosis system that can accommodate it. However, overall, water softeners tend to handle large workloads better than reverse osmosis systems. Reverse osmosis systems aren’t unreliable by any means, but, every once in a while, they can come up short, failing to produce large volumes of purified water when you need it. Water softeners, on the other hand, will produce soft water as long as they are properly maintained and loaded with softener salt. You should note, however, that if your home uses well water, a whole-home reverse osmosis system is a great system to have. Because those with well water don’t have the privilege of having their water purified by the city, a reverse osmosis system makes for a useful device, ridding well water of potentially harmful bacteria and contaminants that water softeners arenot designed to handle. Looking for Water Conditioning Systems in St. Charles, Illinois? Have you made a choice between a water softener and a reverse osmosis system? Maybe you’re interested in installing both? If so, and if you’re looking for water conditioning systems in St. Charles, Illinois, the team at Johnson Water Conditioning can help. We supply and install water softeners and reverse osmosis systems of all sizes. Regardless of the size of your water supply, we can, and will accommodate you. Contact us today to discuss your purification needs!